It recently occurred to me that this year marked my 15th year of covering and reviewing theatre in the Mother City. To celebrate this quasi-momentous occasion, I thought it might be fun to look back at ten of the most memorable, and consequently my favourite productions of this period. Spanning a multitude of genres and ranging in scope from the most intimate of one-handers to musicals with immense casts, these productions nonetheless have one thing in common: they all sparkled with life, imagination and that indefinable something that you can only get from sitting in the dark while live bodies on a stage explore what it means to be human. A special thank you to everyone who has followed my writings throughout this time. Still the best big production musical I have seen in my time as a theatre critic, and I’m talking about the first run. So impactful was this production that Amra-Fay Wright was even invited to join the cast of the West End and Broadway productions to reprise her memorable portrayal of Velma Kelly. To my mind, Samantha Peo was even better in her portrayal of Roxy Hart, nailing every nuance of the character while at the same time carving something out of it that was totally her own. The autumnally funny and infinitely quotable text by Juliet Jenkin, her first, was as bittersweet a paean to the business of maturation as one could ever hope to see. The magnificent and expertly crafted organic friendship of Georgina and Simon (played with such sensitivity by Alex Halligey and Francesco Nassimbeni) is one for the ages and still has a special place in my heart. Although the play dealt with remarkable insight into the psyche of a gay young man, it was so much more than a “coming-out” play. Instead, Jenkin looked further, choosing rather to celebrate sensitive, precocious outsiders in majestic, lyrical fashion. This opulent, yet intimate production of Stephen Sondheim’s musical by director Fred Abrahamse played at the now defunct New Space Theatre on 44 Long Street. Backed by a mini-orchestra and featuring a magnificent cast, it had wily charm to spare and left one with that pure feeling of satisfaction of having seen something close to perfect. The now sadly defunct Mechanicals theatre company delivered one of the most enjoyable, inventive and strangest Shakespeare productions in the city in recent times. Director Guy De Lancey really channelled the restless spirit and randy humour of Shakespeare’s perennially popular play to winning effect. A Shakespeare comedy where one actually laughed, and a lot? Believe it. It happened. Almost all of the Mechanicals players, plus a few guests, were out in full force and it was a welcome sight to see them almost completely unshackled. 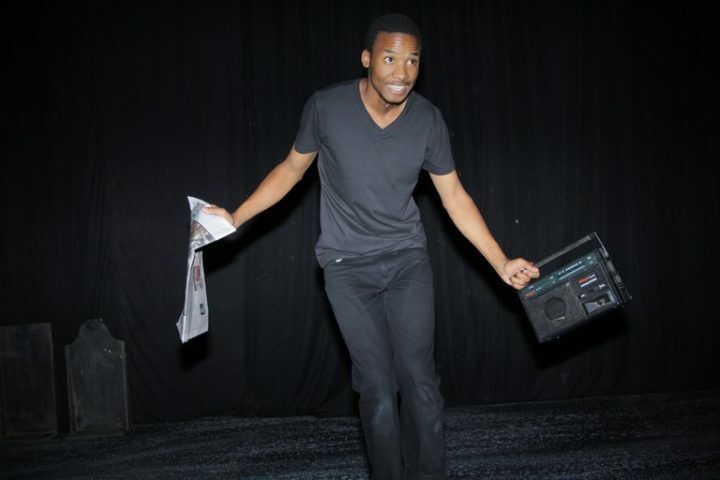 This exhilarating, but ultimately heartbreaking one-man show was the Zabalaza Community Theatre Festival winner for 2013, and was subsequently granted a professional run. Written and performed by the astonishing Phillip Dikotla, ‘Skierlik’ was based on the horrific racially motivated shootings that took place in a rural North West Province informal settlement in 2008. This evocation of rural black impoverishment and the pervasive sense of feeling betrayed by those in power played like a state of the nation address on the stage, only from the perspective of the ruled, rather than the rulers. Please return next week for Part 2.